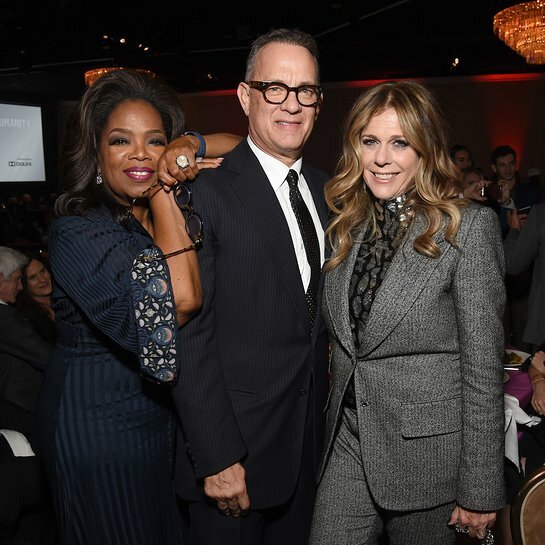 Steven Spielberg, founder of USC Shoah Foundation – The Institute for Visual History and Education, and his wife Kate Capshaw presented Rita Wilson and Tom Hanks with the Institute’s 2018 Ambassadors for Humanity Award at the organization’s annual gala Monday night in Los Angeles. 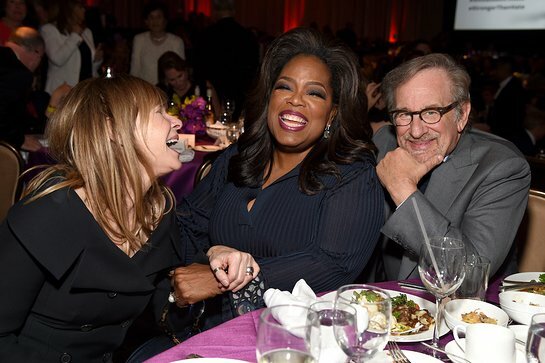 Comedian Martin Short hosted the event, which featured remarks from special guest Oprah Winfrey and a musical performance from Melissa Etheridge. From education and the arts, to healthcare, women’s issues, underserved children and the needs of veterans and their families, Rita Wilson and Tom Hanks are champions of many vital efforts. They have been steadfast supporters of USC Shoah Foundation for more than two decades, helping to further the Institute’s mission to develop empathy, understanding and respect through eyewitness testimony. 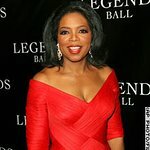 The show began with a powerful introduction from Oprah Winfrey, who took time to acknowledge each of the honorees and the impactful work they’ve done to educate and inspire change in their communities. The night was filled with poignant moments and speeches, punctuated with humor from the evening’s host. The Ambassadors for Humanity event is a crucial part of the Institute’s efforts, helping to forge partnerships and to raise essential unrestricted funds that sustain the organization into the future. The Gala’s call to action this year was USC Shoah Foundation’s Stronger Than Hate initiative. This effort dramatically scales the Institute’s proven testimony-based resources to meet the needs of educators on the front lines dealing with the rising crises of hatred. Ivy Schamis, a Holocaust and social studies teacher from Marjory Stoneman Douglas High School in Parkland, Florida, who uses the Institute’s IWitness educational platform in her classroom, received the organization’s inaugural Stronger Than Hate Educator Award at the event. She was joined by some of her students who were among the survivors of the Feb. 14, 2018, shooting at their school. Stephen Smith, USC Shoah Foundation Finci-Viterbi Endowed Executive Director, lauded Schamis for her longstanding commitment to Holocaust education. Also present were several liberators and liberation witnesses to the atrocities of the Holocaust. These special guests were recognized with the support of the Ford Motor Co., who helped bring them to the event. Doug Darrow, senior vice president, Cinema Busness Group Dolby Laboratories, the Presenting Sponsor of the evening, praised the Institute’s use of technology to pursue its mission of using the voices of the past to create a more peaceful future.